[ how to buy prednisone online use this link 30] Now Simon’s mother-in-law lay sick with a fever, and immediately they told him of her. And he came and took her by the hand and lifted her up, and the fever left her; and she served them. Simon’s mother-in-law is sick with a fever and incapacitated. In the Jewish culture of the first century, hospitality was a big deal and women took their role as caregivers very seriously. For Peter’s mother-in-law to be laying down, the fever that she was experiencing must have been severe. While it may be difficult to relate to the exorcism of a demon, we’ve all had the flu and fever; we can certainly relate to this poor woman’s illness. Having the flu and a fever is debilitating and unpleasant. Jesus took her by the hand and lifted her up; the fever immediately left her. 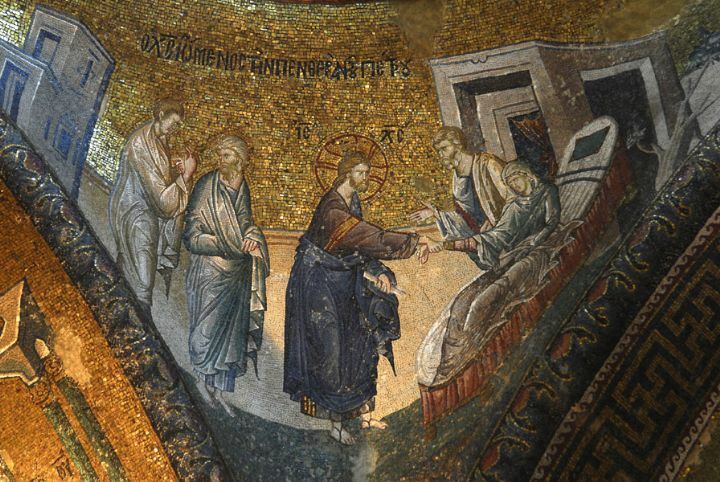 From this, we can deduce that Jesus places a great emphasis on touching those who are ill, is not afraid to catch the fever Himself and that He was perhaps also pretty strong (lifts her up). The fever immediately leaves her. Even with modern medicine, have you ever had this kind of miraculous and immediate healing from a fever? Simon’s mother-in-law immediately responds with gratitude for Jesus’ healing to fulfill her duties. That’s gratitude! We can take great comfort that even today, we can appeal to Jesus Christ for healing and comfort during times of illness. What a blessing!